POWERS/ABILITIES: She has super-speed, enabling her to move up to the speed of sound. This concept came to me as the result of a creative mental exercise. As I’d been reading and enjoying the Geoff Thorne series MOSAIC, for Marvel Comics. One day I starting thinking, what if I had been approached by Marvel like Geoff was, and given the chance to propose a new superhero series for them? I don’t recall if Geoff ever said that he was specifically asked to make his character one of the new Inhumans, whom Marvel had been actively trying to promote as a sort of replacement for mutants (since they don’t have the film rights to the X-Men), but I decided to use that same premise to start off with. For those who don’t know, the storyline in Marvel comics was the discovered that there were many humans throughout the world who were, unbeknownst to them, descendants of Inhumans who left the hidden Inhuman homeland of Attilan. A cloud of terrigen mists had somehow been released and was spreading across the world, and when any of these secret Inhumans are exposed to the terrigen cloud, it activates their latent…Inhumanity(? ), and they transform into a new form. So that’s what happened to Mosaic, as well as the new Ms. Marvel character, and others. So the idea was to come up with my own new Inhuman superhero. Taking in to account that for many Inhumans their terrigen transformations are rather drastic, and that this is something the new Inhumans would not be prepared for, I wanted my character to experience a change that would completely alter their world. 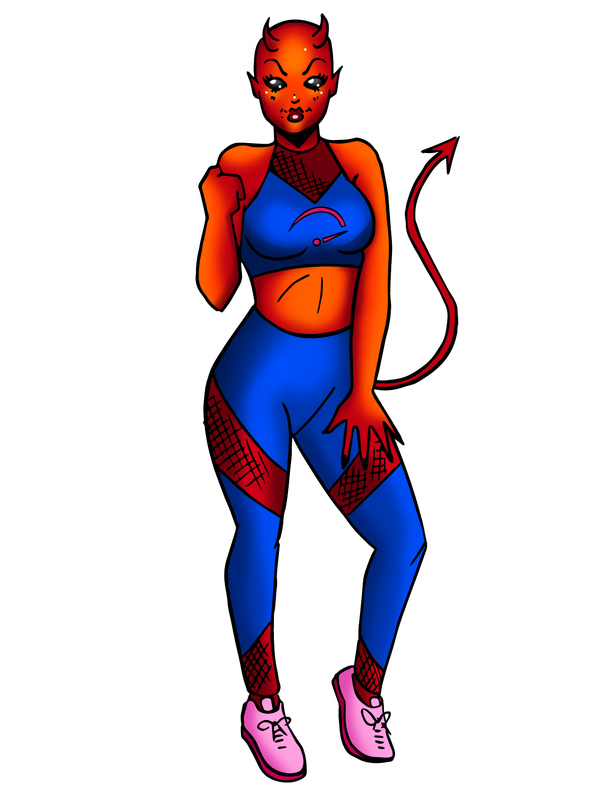 I also decided that my character would be a Person of Color, and a female, because mainstream comics need more characters like that, in my opinion. Eva Torres is young Cuban-American woman raised in Florida, as part of a tight-nit, conservative, upper-middle class, and staunchly Roman Catholic family. The youngest girl among her 6 older siblings, Eva has led a rather sheltered live. She attended All-Girl Catholic boarding schools and was not allowed to date until she was 18, when she was introduced to a 24 year old man named Rafael, who is from a wealthy local family that is close to hers. Rafael is likewise conservative, Catholic, and planning a career in politics. When he proposed to Eva after a year of dating, she eagerly said yes. And thus it appeared that her future as a politicians wife was secure. And then she was affected by the Terrigen cloud. While the cloud gave her the power of super-speed, the other unfortunate side-effect was that it physically transformed her to now look like a demon. Rejected by her family and fiancé, Eva found herself forced to go on the run. She’s the same decent moral person that she always was on the inside, but her demonic appearance negates all that in the eyes of strangers. Initially using her powers just to stay hidden from society as much as possible, she occasionally found herself in situations where she felt the need to use her powers to save people from various tragedies or stop crimes in progress. Eventually she tries to accept that she must have been given these powers for a reason, and vows to use them for good, despite the fear and hatred she often encounters even from those whom she saves, while also trying to build some kind of life for herself, to replace the one she lost. And thus begins the adventures of The Inhuman Speed Demon! And, yes, that’s how I would title the series, in order to emphasize her connection to the Inhumans (whom she would of course eventually meet in the series). So that was the basic pitch. I commissioned the sensational Celina Hernandez for the above image, to bring my character to life (which she did wonderfully). Since then, Marvel seems to even ended the secret Inhumans idea, as the Terrigen mists were destroyed at the end of their big Inhumans Vs. X-Men miniseries. Still I think this character could work, as we could either write her background as saying this all happened before the end of IvX, or instead of an Inhuman we could go ahead and make a mutant. Just say that instead of her powers kicking in at puberty, like most mutants, she was a late-bloomer, and so this didn’t happen until she was 19. One day she just woke up looking like a demon and people able to run really fast. And we could call the series The Uncanny Speed Demon, to emphasize her connection to the X-Men. So it still works.